The main innovation in this era was the collapsible tin paint tube, invented in 1841 by American painter John Rand. This revolutionized the color palette and technique of plein-air oil painting by offering a range of pre-mixed colors in a convenient, portable medium. This was a major factor in the emergence of Impressionism. The practice of oil painting dramatically changed at the end of the ninetieth century when paints companies began to develop a method to maintain pigments particles suspended in linseed oil. Consequently, since then, there was no more need for painters to ground pigments in order to prepare their paints. Spurred on by an increasing demand for dyes to accommodate the growing industrial-scale production of textiles, the process of scientific research into colorants gathered momentum towards the close of the 18th century. As a result, the turn of the century saw the introduction of several new paints - pigments such as Mars reds (synthetic red ochre) chrome orange, and chrome yellow. The 19th century - essentially the beginning of Modern Art - was a period of huge change for both oil painters and watercolorists. New colors and enhanced versions of established pigments popped up with regularity. Cobalt blue emerged in 1807, while viridian was introduced in 1838. Cadmium yellow appeared in 1820, cerulean Blue in 1860, to be followed by cheap synthetic French ultramarine, zinc white, and cobalt violet. Problems remained of course, notably in pigment toxicity as with emerald green. The main reason for the introduction of new oil and watercolor paints had nothing to do with art. Instead, it came about almost entirely as a result of the huge demand for textile dyes for clothing. Thus when a new pigment was discovered, or an old one synthesized, the first beneficiaries were usually textile manufacturers. Artist-quality versions of the pigments took longer to appear, as the demand for such specialist color products was less. He made up his own paint from pigments bought in powder form. Prussian blue was the most common color Constable used for skies. This was mixed with lead white and carbon black to produce the required shades of blues and grays. 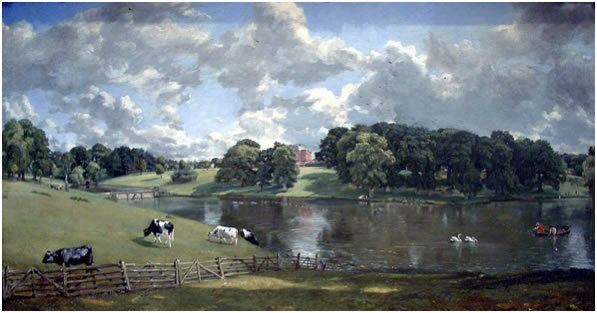 Constable also used red lake and vermilion to add warmth to the colors. Ultramarine was also used for the final touches to a finished sky but it was, and still is, very expensive. Armed with this new battery of brilliant colors, the Impressionists set their canvases alight with fireworks, leading conservatives to denounce them as “dazzlers who painted only with intense colors.” Pissarro claimed to have banished the old, dull “earth” colors from his palette. 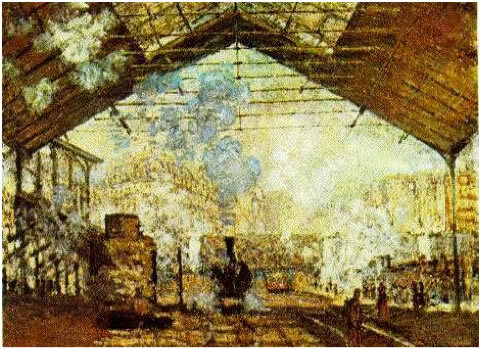 Even the gloom of Monet’s La Gare Saint-Lazare (1877) is a concoction of rainbow hues: cobalt blue, cerulean blue, French ultramarine, emerald green, and viridian. 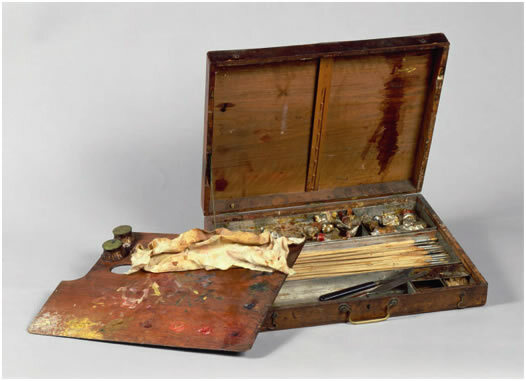 This paint box belonged to Auguste Renoir, probably in the late 19th or early 20th century, at the end of his career. By the 1890s, during the last two decades of his life, Renoir suffered from arthritis and spent most of his time away from Paris. Unable to move his hands freely, a brush was strapped to his arm to allow him to paint. In December 1919, Renoir died at the age of 78. Renoir’s palette consisted mainly of lead white, Naples yellow, chrome yellow, cobalt blue, French ultramarine, Alizarin Crimson (synthetic madder lake), viridian, emerald green, and vermilion.